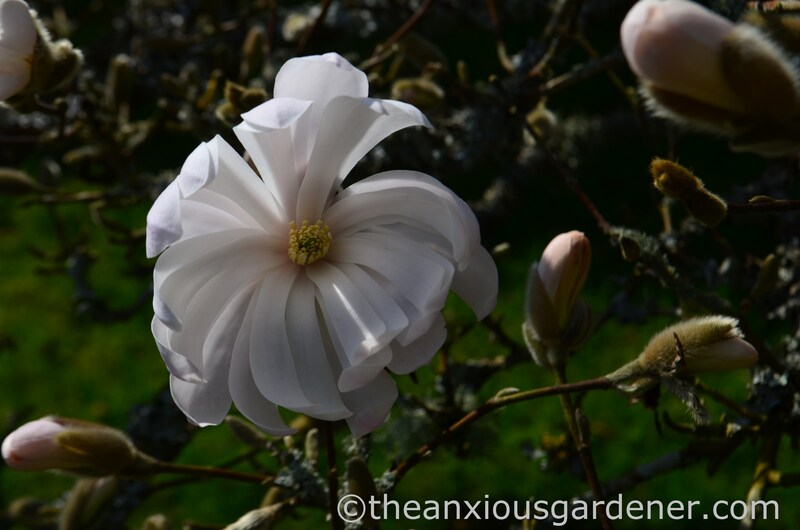 I’m taking a short break from ‘The Anxious Gardener‘ but meanwhile, and after months of winter drear, it seems a shame not to share some images from the last days of March. Daffodils aren’t around for long but The Priory’s brief show is hearty. I’m so used to their regular, faithful appearance that I don’t even bother photographing many of them any more. 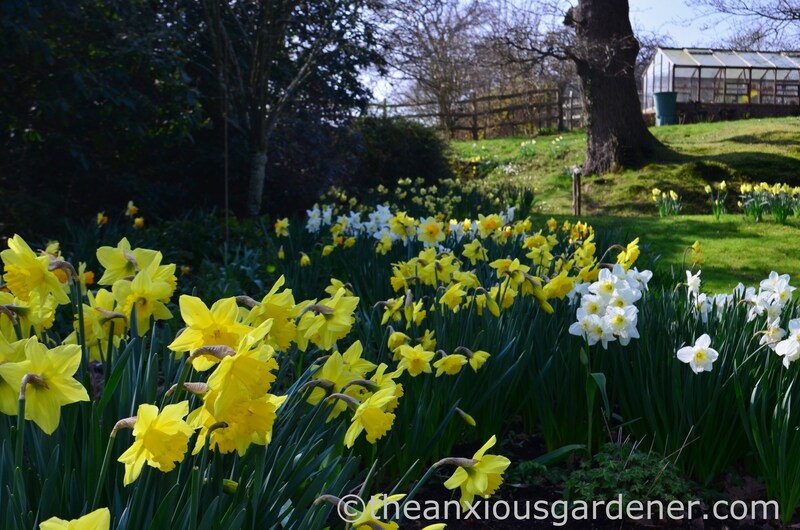 (But I made an exception a month ago for Narcissus ‘February Gold’ – which lived up to its name with about a day to spare). 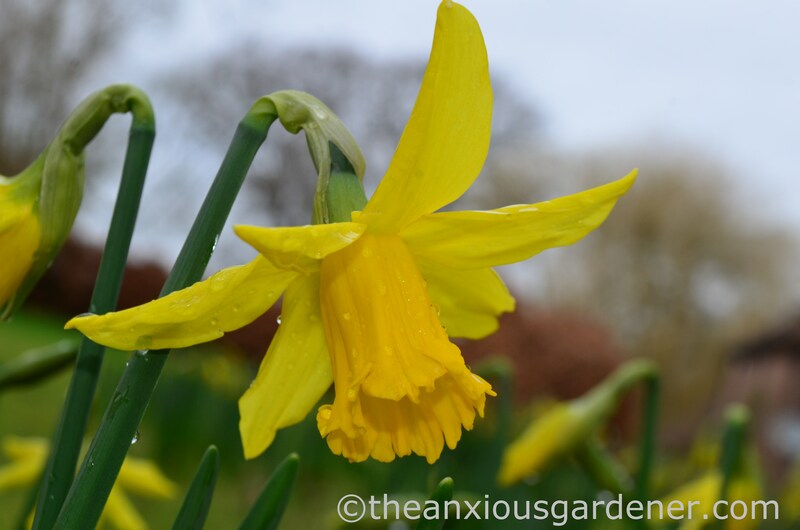 I’ve written before about the dozen or so varieties I’ve planted since 2008 but many Priory daffs pre-date my arrival and, names unknown, continue to thrive. I have an irresistible urge to show the bank below the greenhouses at this time of year. 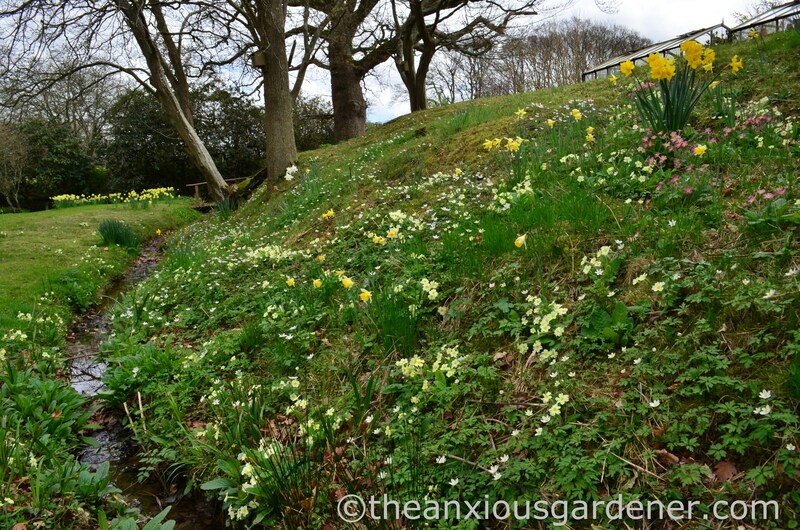 Other than now-over crocuses and snowdrops, I haven’t added anything to this slope. But unlike the previous gardener, I don’t strim it; at least not until the autumn. How he strimmed this splendour is beyond me. I say every year how I love this bank in springtime and especially so as I do nothing to it … other than that one autumnal strim. 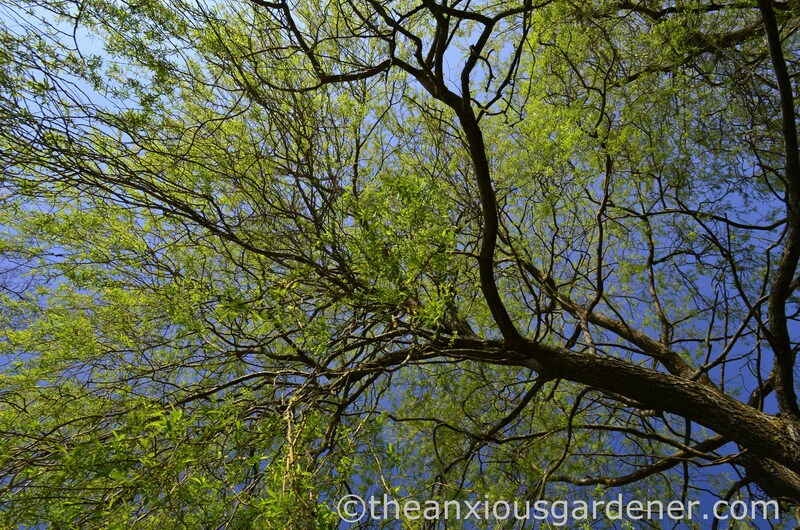 The big weeping willows are coming into leaf and another irresistible urge is to lie down beneath them and, fighting to keep my eyes open, clear my head for a few moments to appreciate scale that most gardens can’t accommodate. A month or so ago, I cut off all the leaves on my bergenias. You don’t have to but I don’t like the black-splotchy old leaves and prefer to start the season with a clean slate: fresh green leaves, clearly visible flower stalks. But do as you like – I shan’t judge. 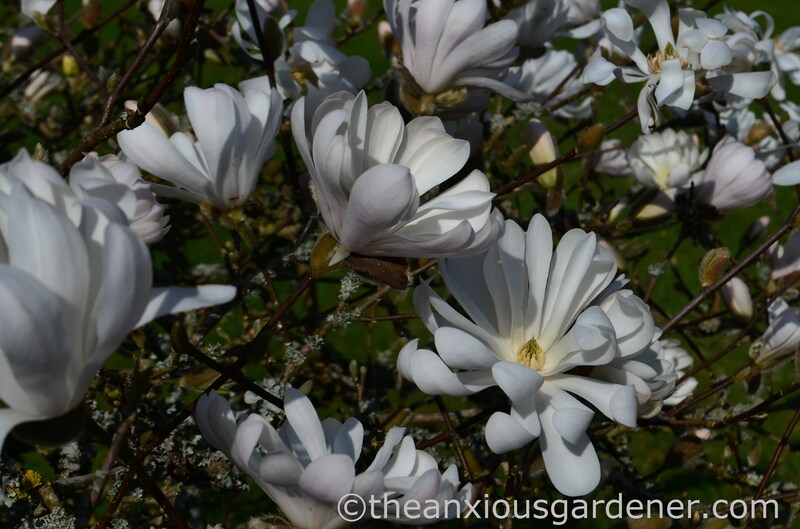 I’ve only ever known one Magnolia stellata intimately. The Priory’s is a little tree and only reaches my chest. It has barely grown taller during the nine years of our intimacy. In the past, its flowers have been browned by frost but this year they are unblemished. Other than giving it an ericaceous feed (about now), a winter mulch of leaf-mould and keeping its planting square free of weeds, I leave it be. I’ve never pruned it. It’s a beauty and when I finally settle into a house for good, with no plans to move, I shall plant one (and hope for lichen too). And honestly, there aren’t many trees or shrubs I can say that about. 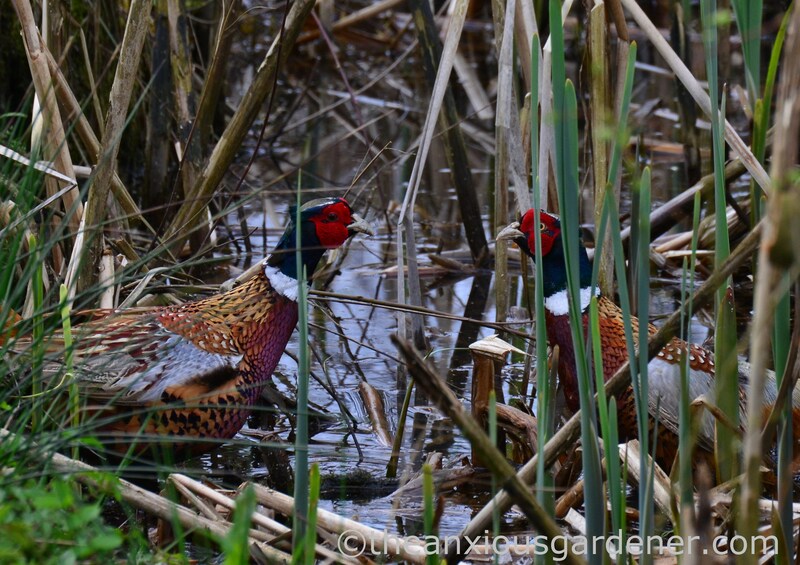 Male pheasants make an awful racket in March. It is particularly their loud, short, territorial proclamation that makes me jump and sets my teeth on edge. These two were having a protracted battle for the Bird Feeder Territory. The scatterings from the feeders make this the must-have territory. Their sporadic fighting drifted back and forth across the lawn, including a dunk in the pond. I don’t know who won the war but I suspect whoever did, will end up the fatter of the two. 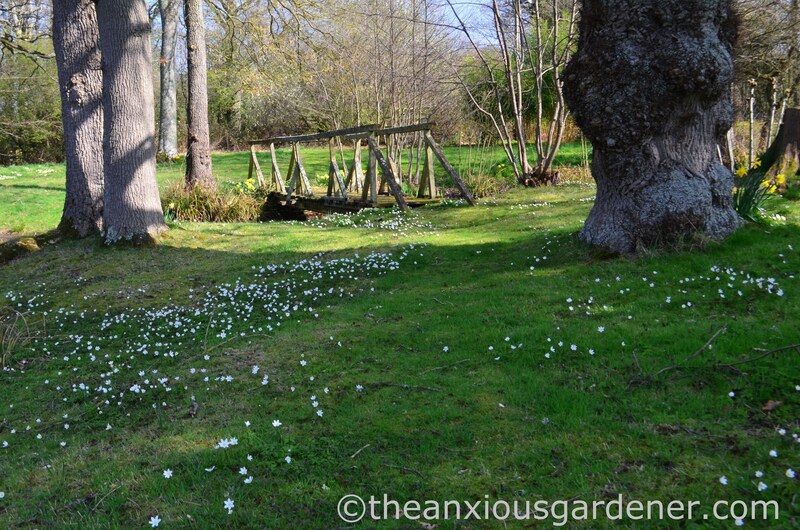 Wood anemones are another rich reward for not mowing and not strimming – though you can see where I cut a path to the bridge when mowing starts again. 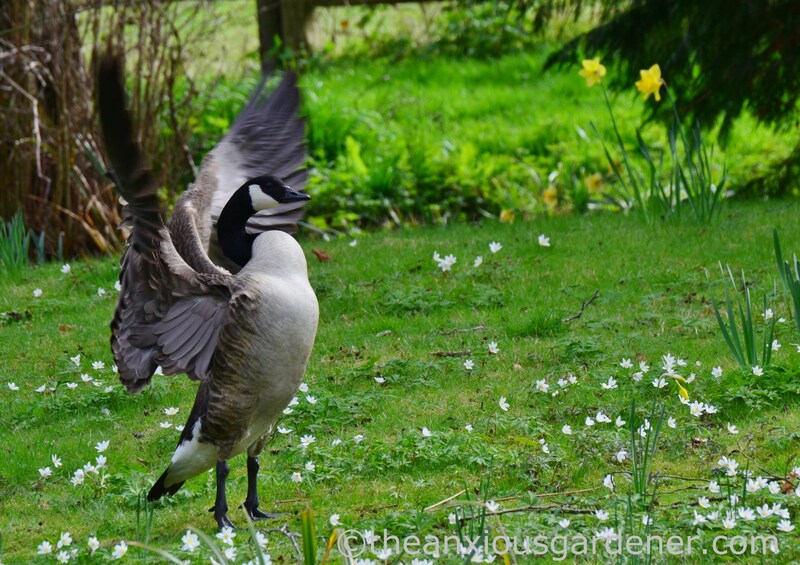 Every spring, at least one pair of Canada geese arrive to pooh on the lawns and honk repeatedly. 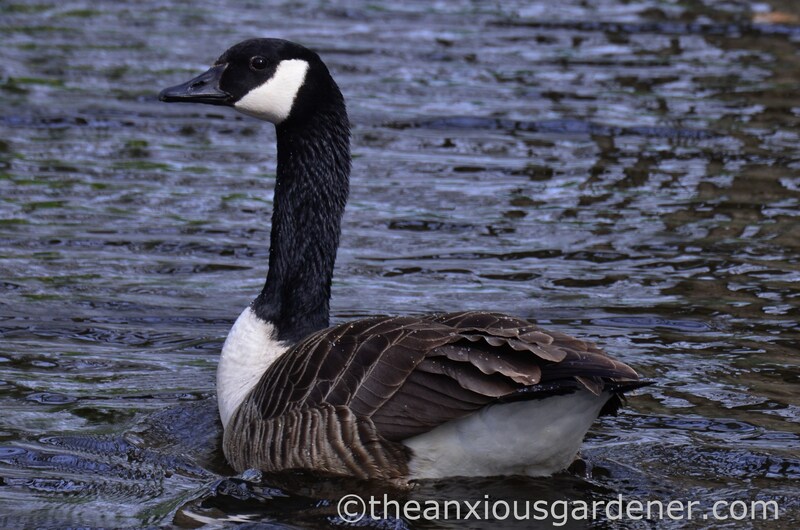 They honk a lot, Canada geese. And pooh. Their arrival is as much a spring marker as any number of daffodils and anemones. 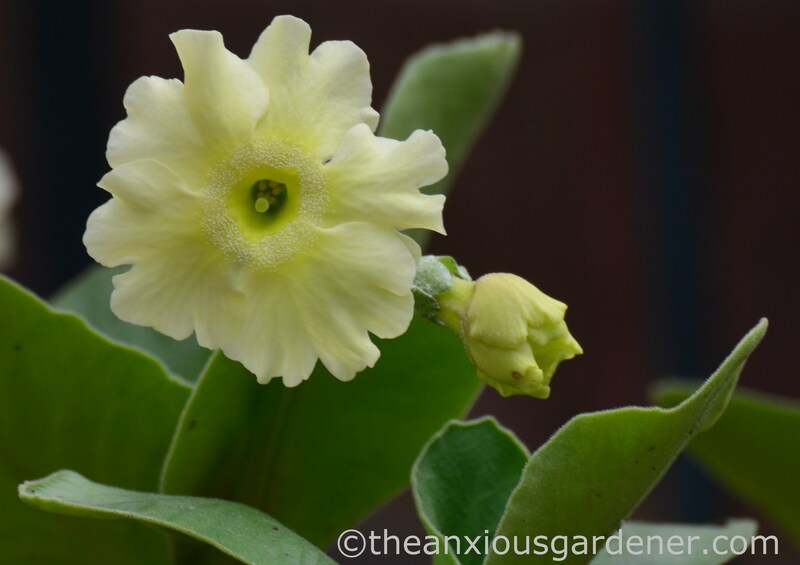 By the greenhouse, one of my few auriculars flowered on Friday. I love auriculars – as perfect a flower as I could wish for. And I love how they almost stare back at you, demanding your approval. An approval I give readily. What a beautiful garden David! I love your daffodils, as well as the rest of your pictures. I’ve thought about getting daffodils for my little urban garden, but not sure how well they would grow in a container. Thank you for sharing! Hi David, I really enjoy reading your blog posts. They are so insightful and give me a lot to think about when i am busy creating the perfect landscape designs and the perfect setting for my clients. Your advice has helped me to incorporate the right kind of plants within the best locations, at the right time of the year. Keep them coming! 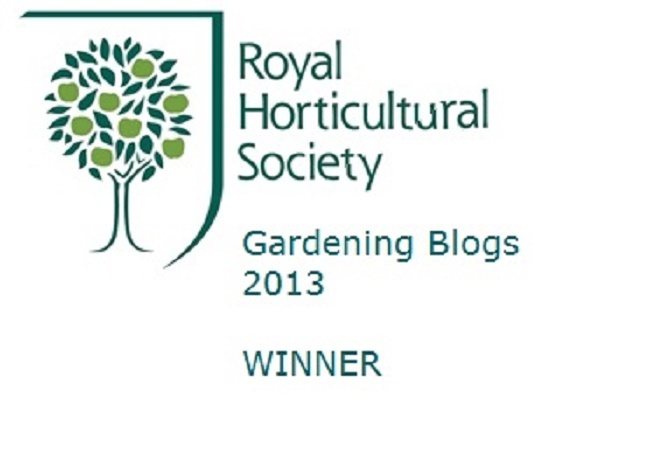 I don’t follow too many gardening blogs, but always read yours. I truly enjoy your combination of image and text. Enjoy your blog free time ! Sally. 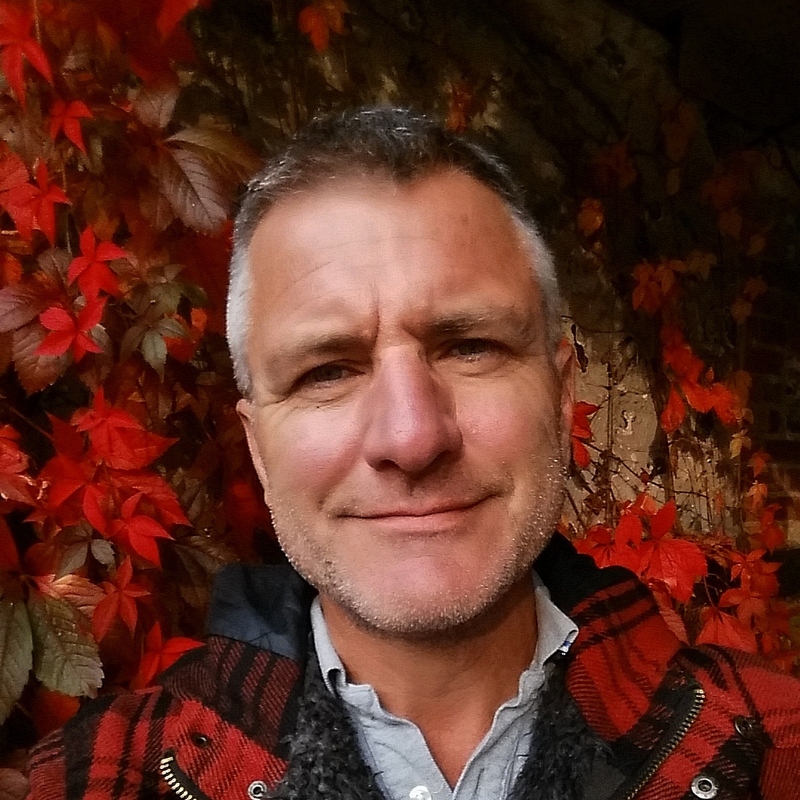 Hi David, good to see this update as I too really enjoy your blog and have been very grateful for all the referrals from your new blogs post! It’s rare to find one more than four feet tall! They can make a reasonably sized shrub (or even a small tree) once they get going, but it takes many years. Thanks Ciar, and I’m pleased the new blogs post was useful. 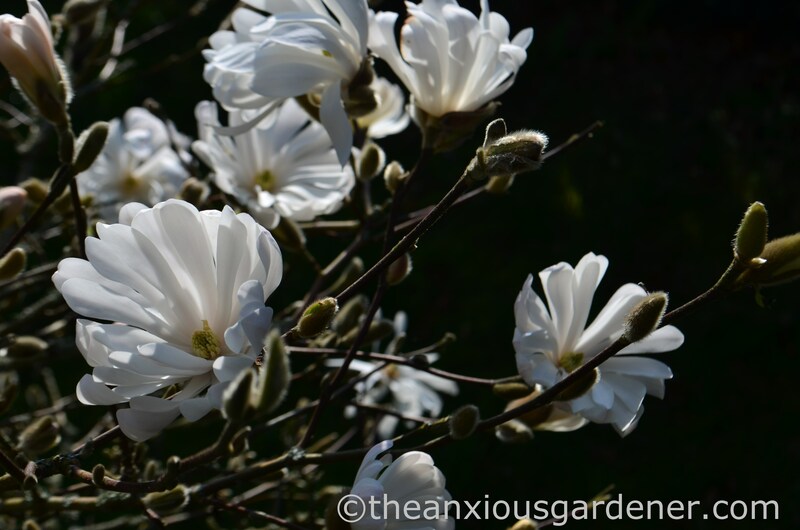 As for the magnolia, and as Pullingweeds says, they are very slow growing – or so I have found – with an ultimate height of about two metres. This brief article might help? (I didn’t realise it is happy on chalk)! How any ‘gardener’ could strim those flowers is beyond me. I am also a gardener and your garden photographs are amazing. It is very peaceful to spend some time in such a beautiful garden. 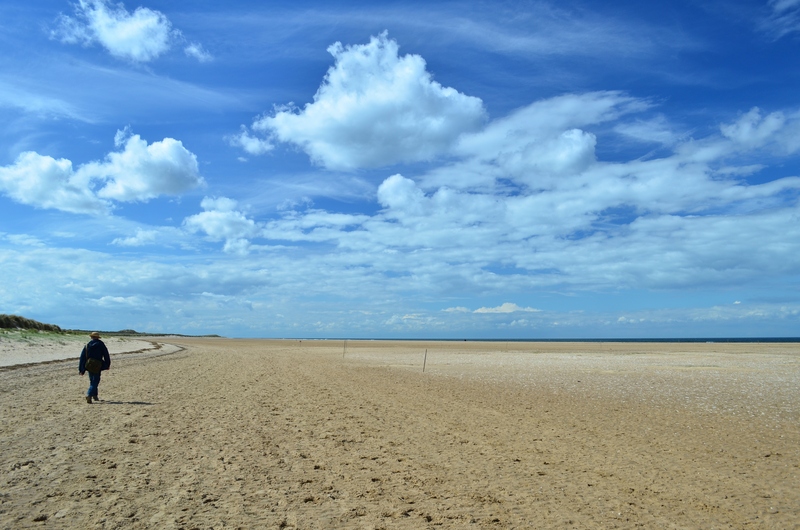 Gorgeous photos – thank you so much for sharing them! The fresh green leaves on the Bergenias do look good. I tend to trim off the old leaves throughout the year as they become ragged and scruffy, but I’ve never stripped them all off. Don’t you find it opens up the ground beneath them for weeds to grow? 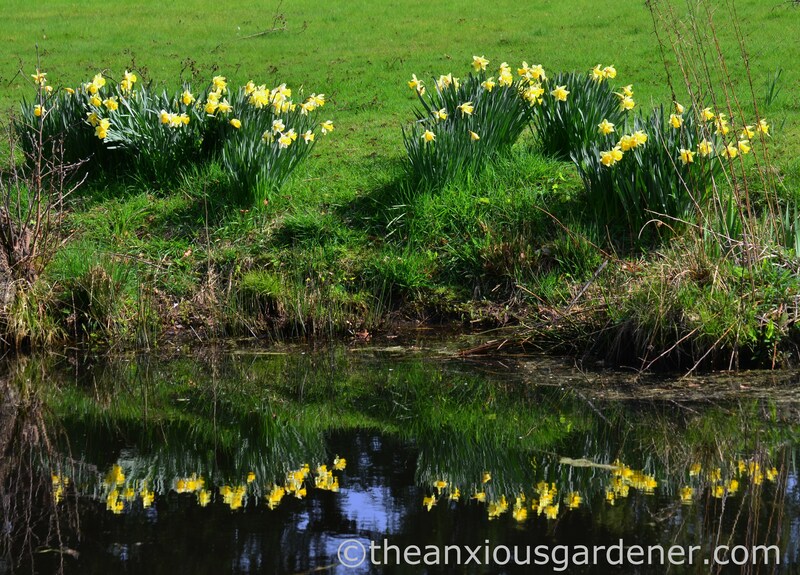 Some wonderful spring pictures David, especially the third one with the daffs reflection in the water. Oh dear, I’m going to reiterate the thoughts of everyone else here and hope you won’t be away too long. Enjoy the break but know how much we appreciate what you choose to share. I just love your blog and wondered where you were. Is the break because the garden is too busy right now? I live in sunny South Africa, but think English gardens are the best. And your blog is wonderful, as you are. If it is a break to have a rest – take it easy. Glad you stopped in for this update. 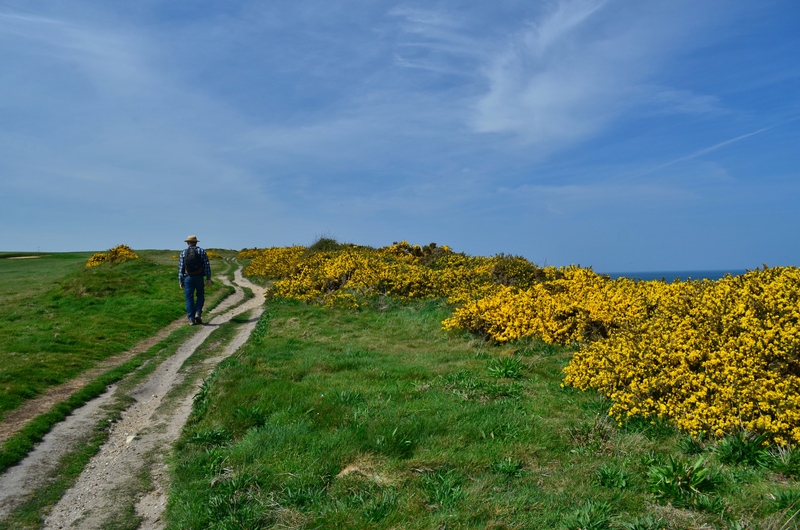 Your slope is everything that’s good about wildflowers and I wish more people weren’t so scared of a little unruliness around their closely cropped turfs. I guess with a break scheduled an update on the house would be too much to ask for eh? 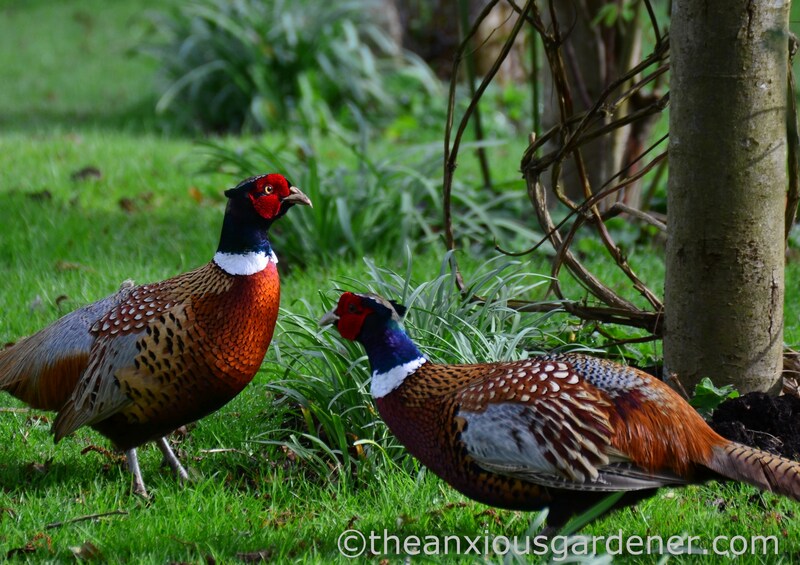 Great pheasant shots – that last is ninja-styling! I am afraid I have to agree too, please don’t be away for too long. 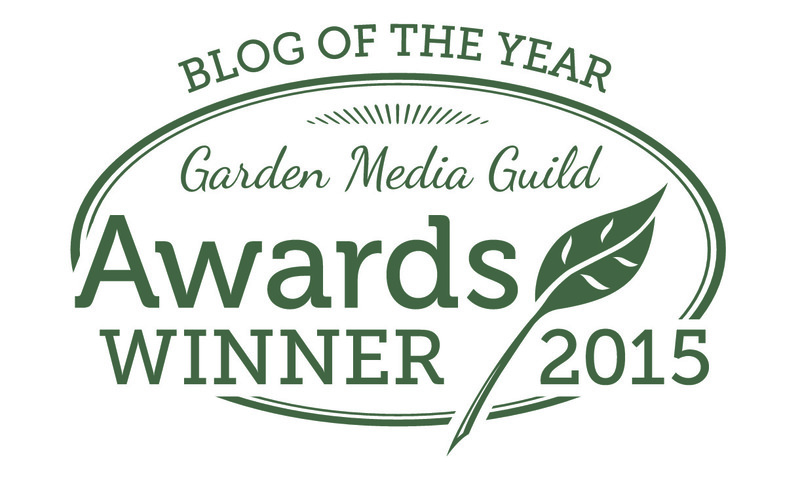 Your blog posts are always an inspiration for me in my garden here in France and at this time of year with everything growing at an alarming rate and so much to do in the garden, I need all the inspiration and help visually I can get! Our daffodils were over by the beginning of March but now we have iris flowering and roses in bud. 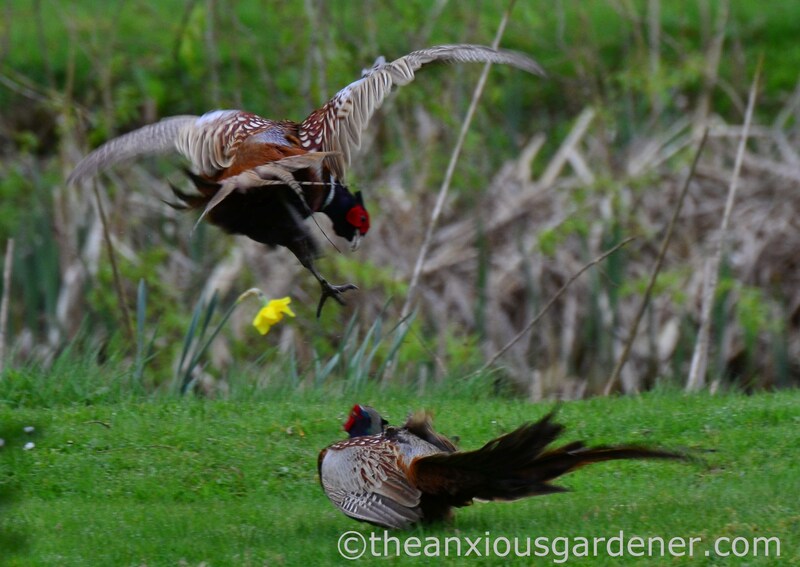 I love the bank of daffodils and your pheasant photography is truly excellent. Have a great break. Those pheasant fights can be vicious. The squawks amuse me though. I love the way they stand on tippy toe to gain full height and then flap their wings so hard they almost fall over. 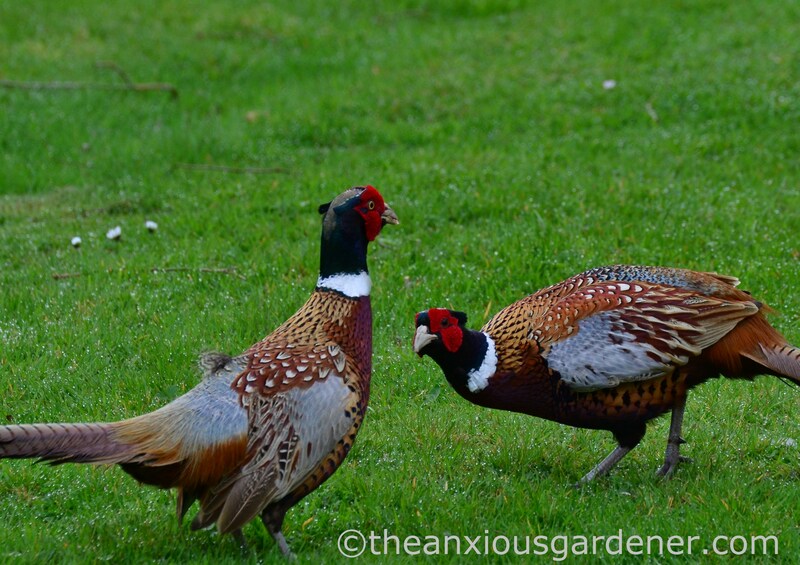 I do really like having the pheasants about but they’re so tame at the Priory, they can be really close to me without my realising. And then the males do THAT call … and I spill my tea. Grrr. Hope your break is not for too long. Sit back and follow us lesser bloggers! I love this post! Very peaceful:) enjoy your break! Your photos of the pheasant fight are fantastic! What gorgeous birds, even if they have annoying voices. 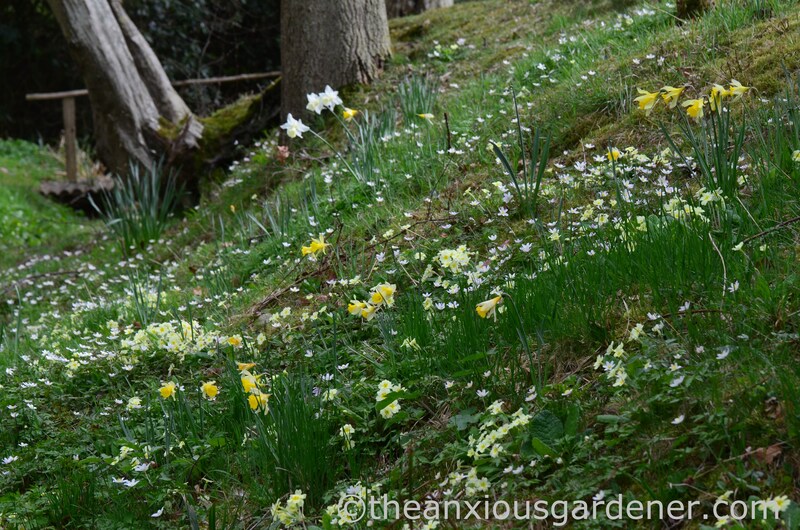 Last autumn, I planted some Narcissus ‘Golden Bells’ and hadn’t realized that they bloom a full month after the early yellow daffs, long after the foliage emerges–or at least newly planted bulbs do. 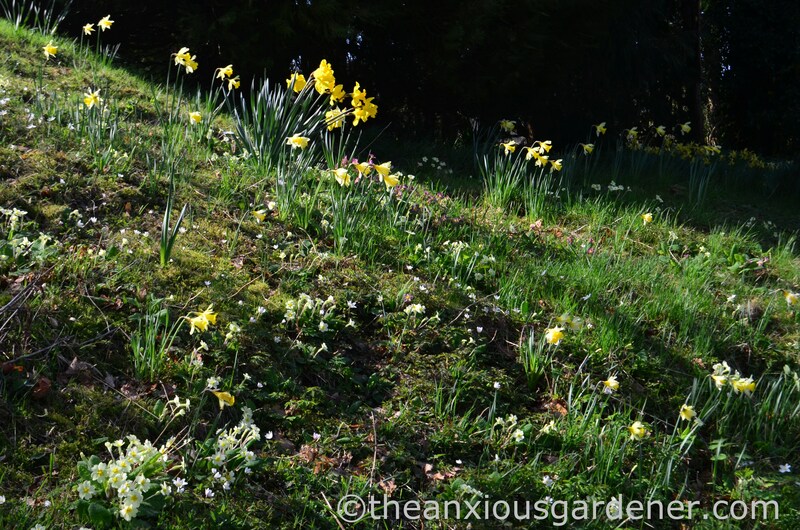 I’m hoping they’ll retain that habit in subsequent years and fill in the period between the early daffodils and the Narcissus poeticus. That would extend daffodil season to encompass most of spring. Beautiful post. We will await your return. 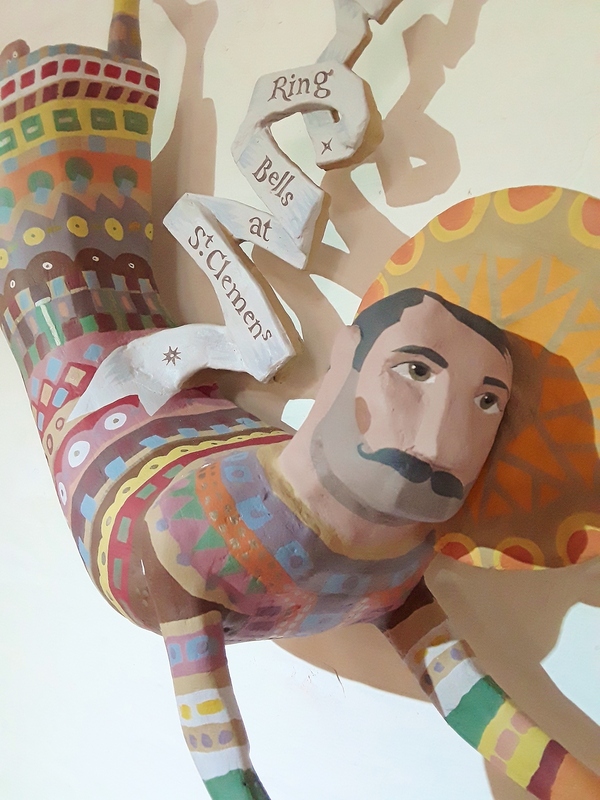 Enjoy your break…and spring! 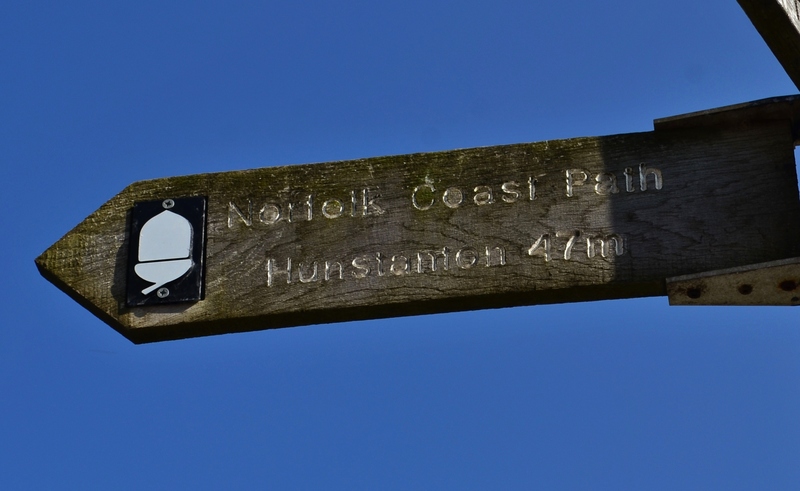 I’m sorry I have to selfishly agree – don’t be away too long! I really enjoy seeing ‘The Anxious Gardner’ notifications in my email. This one was no exception. You are a good steward of the bit of earth you have. Oh, don’t be away too long. I love your blog and beautiful photographs.